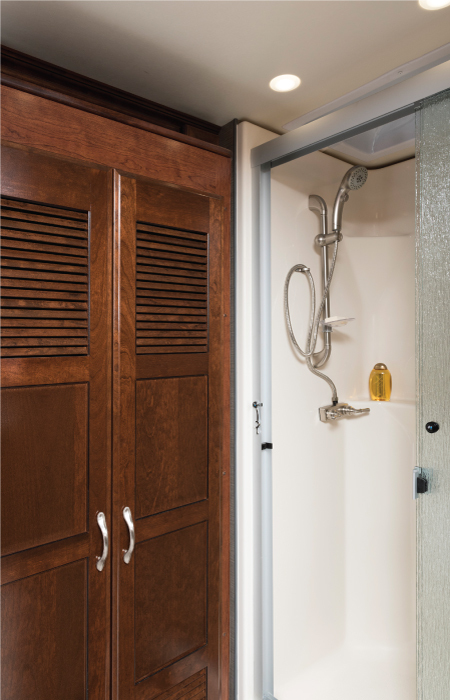 The Fleetwood Southwind makes luxury standard. Features others consider upgrades are built into the design of the Southwind. A 15,000 BTU/H Front A/C with heat pump ensures your coach maintains your comfort year-round and residential-style solid surface countertops provide a luxurious look in every room. The Southwind’s sleek exterior features a high-end exterior chrome package that brings a modern touch to luggage compartment handles and mirrors. Additional helpful amenities are seamlessly integrated, including side view cameras, undercarriage lighting and a built-in power cord reel.